Shadow Scale by Rachel Hartman. Sequel to Seraphina. Review: She can do what with her powers? I shouldn't be in disbelief because she has pulled the same trick on me. In the story Shadow Scale a character named Seraphina is looking for others of her kind. She is half dragon and half human. She thinks that she is the only of her kind. Then she meets others. She is then sent on a mission by the queen to find all 17 half dragons and bring them back before the dragon war spills south. On her journey she encounters many obstacles. She must overcome them because she needs to keep moving. She is expected to find all 17 half dragons in only a matter of a couple of weeks. Who knows what she will find? Who knows whom she will find? Shadow Scale is a book for ages 12 and up. The enjoyment level is somewhere from advanced 6th graders and up. But the vocabulary and complicated plotline make it appropriate for 7th and 8th grade. I would recommend this book to you because I personally like fantasies and this is an amazing fantasy. This is a good book for you because the author gives such vivid details. Do you like action in a book? Then this is the book for you. It keeps you guessing. You never know what could be around the corner. Some words to describe this amazing book are, remarkable, action packed, suspenseful, unknowing, and enticing. This book is just an overall good book. I hope you like the book Shadow Scale. I thank to Rachel Hartman for writing Shadow Scale. We would like to thank Random House for providing a copy of Shadow Scale for this review. 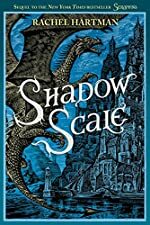 Have you read Shadow Scale? How would you rate it?